As someone with a fairly sizeable appetite, and the kinda girl who orders a smoothie, a latte, and an extra side of avocado on top of an already generous brunch, the whole ‘detox’ thing has never really been well, my thing. My mind is almost always on when and from where my next meal is coming, and the thought of going a day without food has never really appealed to me. Food is not only my fuel; whether I’m training for a half marathon or getting my fix in the yoga studio, it’s also a source on enjoyment, whether in the form of a leisurely lunch or a swanky dinner. However, having been in Bali for almost two weeks and flying solo since my boyfriend’s departure for Sydney, when offered the opportunity to try a three-day raw food and juice detox at Seminyak’s Blue Karma Resort, I decided to give it a go. Tucked away down a quiet side street in Seminyak, Blue Karma Resort offers a serene stay for those in search of a tranquil retreat. Fusing ethnic design with a tropical backdrop, it’s a welcome setting for anyone wanting to relax and recharge in style. The suites are spacious and sumptuous, with modern furnishings, robes, slippers and toiletries – all of which make for a stunning place to stay. The detox can include just juices, solely raw food or a combination of the two; not wanting to throw myself too far in the deep end, I opted to start my first day with raw food, before moving onto two days of juicing. In addition to a full board menu, anyone taking part in the detox is treated to an indulgent daily massage and can choose from aromatherapy, hot stone, shiatsu or Balinese, as well as a trip to sacred Balinese temple Sebatu, for a healing ritual. The opulent, Eastern-inspired restaurant that looked over the resort’s feature pool was the perfect place to begin my detox. I started with a raw lasagna for lunch, which was beautifully presented and followed with an aromatherapy massage, which was a great way to wind down after a day spent in the Balinese sunshine. For dinner I had a mouth-watering avocado and coconut soup followed by zucchini primavera; and went to bed feeling both satiated and serene. While food was off the menu for the next two days, with seven juices a day – one every two hours – I barely had the time to think about being hungry. My first juice of the day was probably my favourite – Purity by name, it consisted of young coconut water, almond milk, date puree and vanilla bean, and was accompanied by a Spirulina lime pomelo shot, which was surprisingly tasty. Two hours later my juice was made up of lemon, ginger, cinnamon, aloe vera and water – which certainly had a kick to it. My midday juice was a green one, and came with a delicious orange wheatgrass shot and the afternoon offerings were a combination of greens, root vegetables and fruit juices. I had another early evening massage, this time a hot stone one, before the night-time juice; maca, cacao nibs, almond milk, coconut water and palm syrup, a delicious elixir before an early night. I thought I’d wake up starving the next day and had been told by the chef in charge of my detox that if at any point I wanted food to let him know and I could revert back to raw food. But quite honestly, and surprisingly for me, I was never hungry during the detox. For my third and final massage I chose the traditional Balinese massage and had another early night before my trip to Sebatu – a water temple where visitors can experience a traditional holy blessing – the following day. 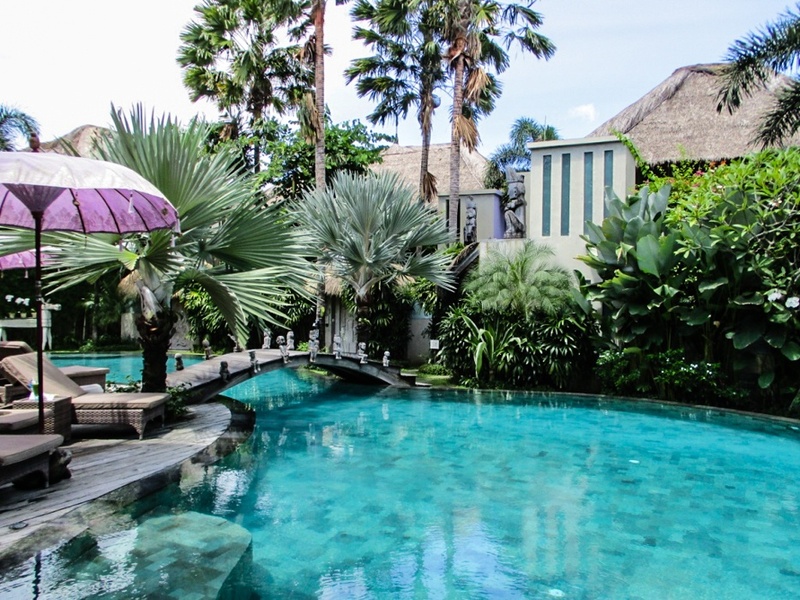 Blue Karma Resorts have two properties; one in Seminyak and one in Ubud. While the latter’s proximity to Sebatu would have meant a much shorter drive, I found the two-hour journey an inspiring one as we made our way past bustling Balinese villages, tropical green rice paddies and traditional temples along the way. The hotel had prepared a sarong which visitors are obliged to wear and a towel for me to use after immersing myself in the holy water. The experience was certainly a spiritual one; after walking about 300 metres downhill I waded into the water and under the waterfall. To bathe in the holy water. Despite it being a popular destination for both tourists and locals alike, it was almost deserted when I visited, which added to the tranquillity of the environment. The place itself is serene, and I immediately felt a certain awe and calmness on stepping into the water, one that remained throughout the entire drive back to Seminyak. It was a fitting end to an idyllic and eye-opening few days at Blue Karma Resort; a place I left feeling refreshed, revitalised and blissfully relaxed. The Fit Traveller was a guest of Blue Karma Resorts for this stay. As always, the opinions, words and images are authentically our own.